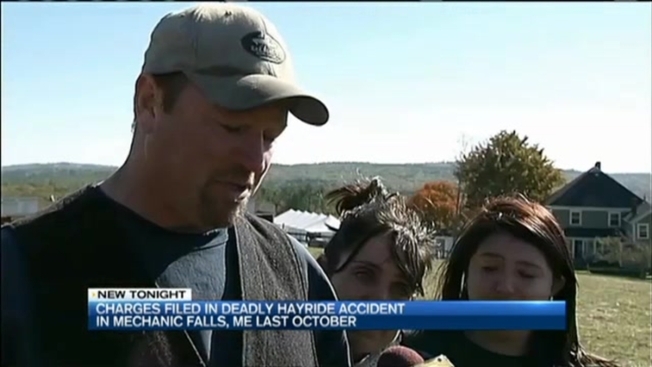 A Maine grand jury handed up criminal charges after a fatal haunted hayride accident last October. Harvest Hills Farm in Mechanic Falls will be charged with manslaughter, aggravated assault, driving to endanger and reckless conduct after a hayride accident that resulted in the death of 17-year-old Cassidy Charette of Oakland. The business owner, Peter Bolduc, has not been charged. The driver of the Jeep pulling the hayride, David Brown, is facing reckless conduct charges. The district attorney had mistakenly announced Brown would be charged with manslaughter. The grand jury has also indicted the mechanic, Phillip Theberge. He has been charged with reckless conduct. Authorities said mechanical issues caused the vehicle to malfunction, careen down a hill, and eject its passengers. More than 20 people were injured in the hayride accident on Oct. 11, 2014. The jury reconvened Tuesday after holding previous sessions in May and June. "The grand jury was provided with a great deal of evidence," said District Attorney Andrew Robinson. An attorney representing Charette's family said they will be pursuing a wrongful death suit in a civil case. Lawyer Jodi Nofsinger said her clients are trying to focus on honoring Cassidy's memory. "Their focus right now is to work on preserving her memory, people remembering her life, and remembering all the incredibly positive impacts she had on people's lives," said Nofsinger.